This tutorial explains the basics of the Excel HYPERLINK function and provides a few tips and formula examples to use it most efficiently. There are many ways to create a hyperlink in Excel. To link to a certain web page, you can simply type its URL in a cell, hit Enter, and Microsoft Excel will automatically convert the entry into a clickable hyperlink. To link to another worksheet or a specific location in another Excel file, you can use the Hyperlink context menu or Ctrl + K shortcut. If you plan to insert many identical or similar links, the fastest way is to use a Hyperlink formula, which makes it easier to create, copy and edit hyperlinks in Excel. The function is available in all versions of Excel for Office 365, Excel 2019, Excel 2016, Excel 2013, Excel 2010, Excel 2007, Excel 2003, Excel XP, and Excel 2000. In Excel Online, the HYPERLINK function can only be used for web addresses (URLs). Link_location (required) is the path to the web-page or file to be opened. Link_location can be supplied as a reference to a cell containing the link or a text string enclosed in quotation marks that contains a path to a file stored on a local drive, UNC path on a server, or URL on the Internet or intranet. If the specified link path does not exist or is broken, a Hyperlink formula will throw an error when you click the cell. Friendly_name (optional) is the link text (aka jump text or anchor text) to be displayed in a cell. If omitted, link_location is displayed as the link text. Friendly_name can be supplied as a numeric value, text string enclosed in quotation marks, name, or reference to a cell that contains the link text. Clicking a cell with a Hyperlink formula opens the file or web-page specified in the link_location argument. More formula examples demonstrating other uses of the Excel HYPERLINK function follow below. Moving from theory to practice, let's see how you can use the HYPERLINK function to open various documents directly from your worksheets. We will also discuss a more complex formula where Excel HYPERLINK is used in a combination with a few other functions to accomplish a non-trivial challenging task. 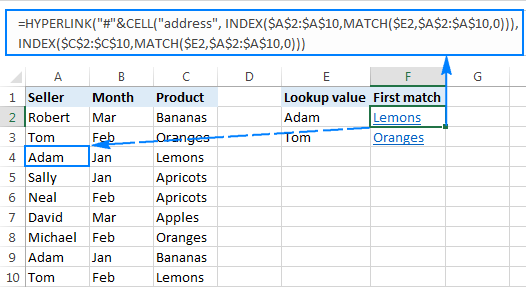 The Excel HYPERLINK function enables you to insert clickable hyperlinks of a few different types depending on what value you supply to the link_location argument. The above formula creates a hyperlink with the jump text "Sheet2" that opens Sheet2 in the current workbook. When you move the files, the relative hyperlink will continue working as long as the relative path to the target workbook remains unchanged. For more information, please see Absolute and relative hyperlinks in Excel. To make a hyperlink to a specific location in a Word document, enclose the document path in [square brackets] and use a bookmark to define the location you want to navigate to. The above formula inserts a hyperlink, titled "Go to Ablebits.com", that opens the home page of our web-site. The above formula adds a hyperlink titled "Drop us an email", and clicking the link creates a new message to our support team. When working with large datasets, you may often find yourself in a situation when you need to look up a specific value and return the corresponding data from another column. For this, you use either the VLOOKUP function or a more powerful INDEX MATCH combination. But what if you not only want to pull a matching value but also jump to the position of that value in the source dataset to have a look at other details in the same row? This can be done by using the Excel HYPERLINK function with some help from CELL, INDEX and MATCH. To see the above formula in action, consider the following example. Supposing, you have a list of vendors in column A, and the sold products in column C. You aim to pull the first product sold by a given vendor and make a hyperlink to some cell in that row so you can review all other details associated with that particular order. As shown in the screenshot below, the formula pulls the matching value and converts it into a clickable hyperlink that directs the user to the position of the first match in the original dataset. Those of you who are familiar with the INDEX MATCH formula as a more versatile alternative to Excel VLOOKUP, have probably already figured out the overall logic. The MATCH function determines the position of "Adam" (lookup value) in range A2:A10 (lookup range), and returns 3. The result of MATCH is passed to the row_num argument of the INDEX function instructing it to return the value from the 3rd row in range C2:C10 (return range). And the INDEX function returns "Lemons". This way, you get the friendly_name argument of your Hyperlink formula. Now, let's work out link_location, i.e. the cell the hyperlink should point to. 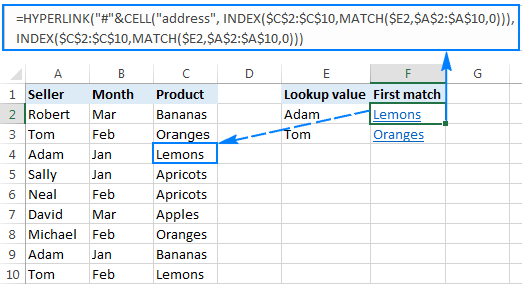 To get the cell address, you use the CELL("address", [reference]) function with INDEX MATCH as reference. For the HYPERLINK function to know that the target cell resides in the current sheet, concatenate the cell address with the pound character ("#"). Note. Please notice the use of absolute cell references to fix the lookup and return ranges. This is critical if you plan to insert more than one hyperlink by copying the formula. 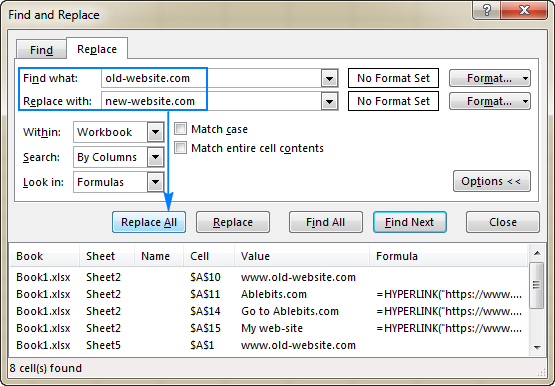 As mentioned in the beginning of this tutorial, one of the most useful benefits of formula-driven hyperlinks is the ability to edit multiple Hyperlink formulas in one go by using Excel's Replace All feature. 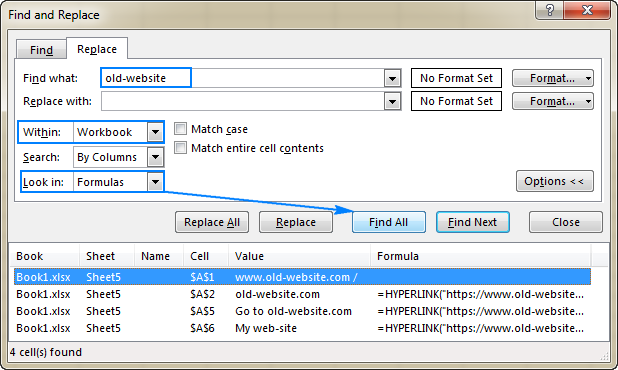 Press Ctrl + H to open the Replace tab of the Find and Replace dialog. In the right-hand part of the dialog box, click the Options button. In the Find what box, type the text you want to change ("old-website.com" in this example). In the Within drop-down list, select either Sheet or Workbook depending on whether you want to change hyperlinks on the current worksheet only or in all sheets of the current workbook. In the Look in drop-down list, select Formulas. Look though the search results to make sure you want to change all of the found formulas. If you do, proceed to the next step, otherwise refine the search. In the Replace with box, type the new text ("new-website.com" in this example). Click the Replace All button. Excel will replace the specified text in all found hyperlinks and notify you how many changes have been made. Click the Close button to close the dialog. Done! In a similar fashion, you can edit the link text (friendly_name) in all Hyperlink formulas at the same time. When doing so, be sure to check that the text to be replaced in friendly_name does not appear anywhere in link_location so that you won't break the formulas. If the link destination does not open when you click a hyperlink, make sure the link location is supplied in the proper format. Formula examples to create different hyperlink types can be found here. If instead of the link text an error such as VALUE! or N/A appears in a cell, most likely the problem is with the friendly_name argument of your Hyperlink formula. Typically, such errors occur when friendly_name is returned by some other function(s), like in our Vlookup and hyperlink to the first match example. In this case, the #N/A error will show up in the formula cell if the lookup value is not found within the lookup table. To prevent such errors, you may consider using the IFERROR function to display an empty string or some user-friendly text instead of the error value. This is how you create hyperlinks using the Excel HYPERLINK function. I thank you for reading and hope to see you on our blog next week! 17 Responses to "How to use Excel Hyperlink function to create different link types"
Is there a way to create a basic hyperlink formula using an absolute cell reference within the same or a different workbook? I have tried adding the $ to cell reference in link location but it does not appear to work. Thanks! Never mind...I was able to get an absolute reference to work only when a defined/named range is used instead of direct cell reference. For anyone who cares :)! I have a formula which relates to a separate sheet in the workbook. I would like it to be hyperlinked to the other sheet. The problem is that the list is too long to do this individually. Is there a way I can add the hyperlink into the existing formula. and want to replace column to "!m1", "@m1" how to set it? I have a hyperlink to a cell in the same worksheet, however, when a row is added or deleted, the hyperlink then points to the wrong cell. How can I make the hyperlink relative so it always points to the correct cell, regardless of how many rows are added or deleted? Thank you so much!! I have an Excel file with different reference numbers in each cell (row) Hyperlinked as shown below. when I add new rows and drag the last reference number down I get reference numbers in serial but the hyperlink doesn't change. Every time I have to spend lot of time to change manually. IS THERE ANY WAY TO CHANGE THE HYPERLINKS AT A TIME?? Hello! Can you provide a few examples for why someone would use the create a hyperlink that creates a pre-addressed email message feature in Excel. I'm going through the Excel 2016 exam 77/727 guide, and I'm having a little difficulty determining under what circumstances a user would use this feature. I want to inset cell reference i.e C3 at (subscription_prices) i.e bookmark place..
Pls kindly help with respect to above.. I have tried every variant from simple to complex and I don't even get an error message (#VALUE or N/A) returned, just the text of the formula as I typed it as if Excel 2007 doesn't even recognize it as a formula. Is the formula part of a toolpak or add-in I need to install?